This is a Tale of Two Sandwiches; they were the best of sandwiches, not the worst of sandwiches. While I spend most of my time in this column talking about the cool things to do in Denver after the Rockies swallow the sun, today I’m going to deviate a tad from discussing venues’ sweaty greenrooms and sticky floors to discuss another critical piece of nightlife: what to eat the next day. While Pizza by the Slice has a special place in my heart, I love me a good sandwich, too. On the morning after, sometimes all you want is to swallow a Plan B and a hunk of buttered toast. There’s something wonderful, when you’re bleary, exhausted, and slightly hungover, about sitting down to a robust sandwich with runny egg yolk or tangy mayo baptizing a slab of protein and then letting carbohydrates work their opioid magic on your beleaguered brain. 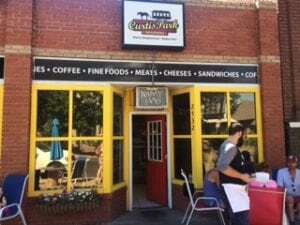 I live in the Clayton neighborhood and frequently bike home from LoDo past a couple of noteworthy sandwich joints with very different philosophies. The first, the Curtis Park Delicatessen, on 25th and Champa in Curtis Park, is a hipster return to the traditional neighborhood deli. I biked past this establishment for years and never gave it much thought, as I don’t go in hard for cold cuts and that’s all I could associate with “delicatessen.” My longtime neighbor and eating buddy, Jim, began frequenting them a year or so ago. “They remember my name and my order. I’m a ‘regular’ with a ‘usual’!” he boasted to me. I might not be a fan of slimy sheets of weird meat, but I’m a sucker for feeling like part of an insider group. Like, you know, a regular at a local eatery. Thus, a couple months ago, Jim escorted me through the door into their tiny storefront and, sure enough a Greek chorus of hip, bearded dudes sang out, ”Hey, Jim! How ya doin’? The Italian again?” These guys know their customers. My go-to at the CPD is the “Park” sandwich, a loving concoction of liquid-yolk eggs, white cheddar that tastes like descended from the Olympus of Dairy, prosciutto, and some abso-f-ing-lutely delicious bread. My first time there, I was doing a gluten-free diet experiment (hey, I’m a Millennial. I had to try it.) and gluten-free bread is universally awful. Not so at the CPD. In fact, it was so good that I ordered it again the next time, even though I had quit the dietary experiment. The prosciutto was tender, rich, savory, and so non-mysterious that even a sheet-meat skeptic like myself genuinely loves it. Add a house-made pickle and I’m in a near-narcotic state of bliss. 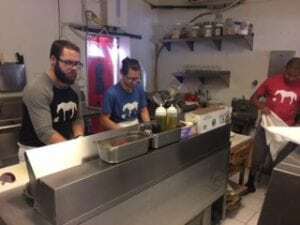 The sandwich slingers behind the counter are happy to customize your order (I sometimes get the vegetarian ‘wich and mix up the cheese choices!) and they always remember how I ordered it last time. When was the last time the Chipotle dude remembered your aversion to cilantro? Water at the CPD is a help-yourself affair with tall bottles in a cooler with pre-chilled Mason-jar glasses at hand. If you want to level-up your beverage experience, order an iced chai. Peruse the display case filled with local, artisan meat and cheese products and imagine seducing your palate with them later on. (I’m going to shout out here to one particular delicacy—their sauerkraut, made by Vibrant Veggies, is local, probiotic, and small-batch produced. 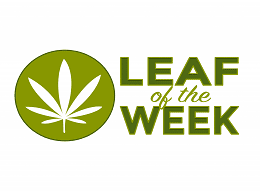 Check it out to taste a new take on old cabbage.) Complete the excursion by requesting a half-pound of white cheddar or Amish bleu to be wrapped up to- go for enjoyment later. If you’re really feeling self-indulgent, get some of that prosciutto, too. Your future self will thank you. The yin to this sandwich yang is the Bird Call, on 26th and Clarkson in Five Points. I discovered this post-modern eatery by olfaction when biking home, late and hungry. I could smell the fried chicken lingering in the air even after hours. That might sound like it could be a bad thing, but it was delicious. I was still on the gluten-free kick, so I dispatched Jim to check it out. He live-texted me the results, which went something like this: “Mmmmm.” “This is excellent.” “This is a great sandwich.” “The sauce is succulent,” and so forth, which is exactly what diet-restricted people like hearing about the food they can’t eat. Bird Call leaps into a hungry Silicon Valley UX-designer’s daydream. 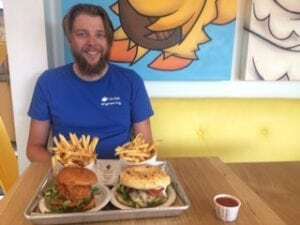 You place your order on a tablet device whose interface prompts you to choose from among several different sandwich choices, as well as salads and some kid-friendly options. You can then navigate an easy option to edit the toppings, sauces, sides etc. that you want with your ‘wich. (I strongly recommend the fries. They’re hot, fresh, with slips potato skin still visible and big kernels of fancy salt clinging to their surfaces.) 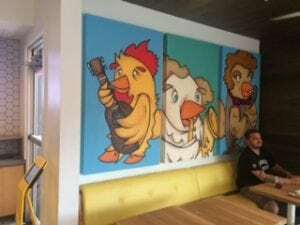 The décor is chicken-themed. I withhold opinion on that artistic choice. 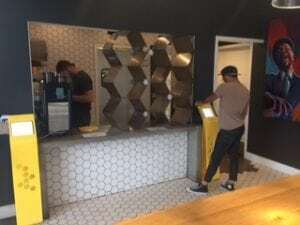 Your order’s progress is displayed on a continually-updating screen and the food is delivered through a wall bank of octagonal, chicken-wire-shaped cubbies. It’s a strange combination of a totally personalized, completely disconnected transaction. The ordering/delivery paradigm is novel, but the food is classically delicious. This is the best possible version of fast food. This is what Chik-Fil-A could be if they made amends for their execrable politics and leveled up their food game by at least two leagues. The Bird Call’s bread is nowhere near what the CPD offers, but it’s not supposed to be that. It’s supposed to be soft, white, comfort-food buns, and it is. The chicken is superb. Hot out of the fryer, crispy on the breading, angelically moist and tender in the meat. The sauces are reliable to their names (“yep, that’s ranch dressing, alright”) and so are the pickles. It’s so rare that something we have nostalgic memories of from our childhoods lives up to those memories when we recreate them as grown-ups. A Bird Call chicken sandwich is the adult fullness of the kids-menu chicken fingers of yesteryear. So here you have it, folks. Curtis Park/Five Points offers some wonderful options for morning-after eating. 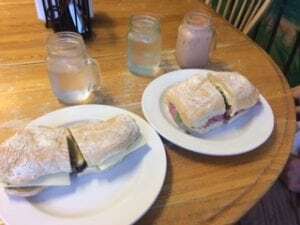 To get local, foodie, back-to-our-roots eats in a cozy and personal interaction, make your way to the Curtis Park Deli. (They also do catering and private events, if your guests are sandwich aficionados like yourself.) 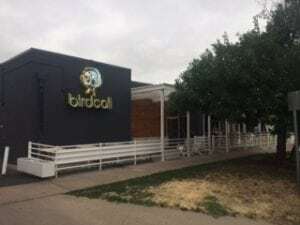 For a taste of the future and a fast-hot slice of bird, get yourself to the Bird Call. Either way, the questionable choices of last night will fade away and the new day will start to seem as welcoming as a warm, cheesy plate of carbohydrate goodness. And not a moment too soon. Jessie Hanson lives and works in Denver and couldn't be happier about it. Like the best-possible kind of Jekyl-and-Hyde scenario, she splits her life between science and storytelling. During the day, she performs clinical diagnostics and messes around with test tubes. At night, she performs behind the mic as a standup comedienne, in the air as a circus aerialist, and in rhinestones as burlesque dancer. She begrudges the hyper-inflated cost of a decent pair of false eyelashes. When she's not on stage, she sweating it out as an endurance athlete in triathlons and marathons across the West. She begrudges the hyper-inflated cost of a decent pair of running shoes. She's thrilled to be on board with OnDenver and writing about science, comedy, circus, athletics, and general fun on the Front Range!